Raspberry Lemon Icebox Pie is a seriously easy, no-bake summer dessert that will have everyone fighting for seconds! 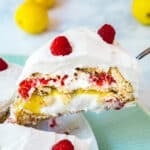 Made with vanilla wafers, lemon pie filling, fresh raspberries and whipped topping, it's a delicious way to make a killer dessert without having to turn on your oven. Remove a few of the nicest looking raspberries from the container and set aside. Take two pieces of saran wrap and line the pie plate with them, so that they cross in the middle like a lowercase T (they should all be right up against the whole pan with extra wrap coming out of the pan). Take a small scoop of whipped topping and spread it into a very thin layer to completely cover the plastic wrap inside of the pan. You don't need much, it's just a tiny amount to adhere the first layer of vanilla wafers. Line the bottom and up the sides of the pan in a single layer of vanilla wafers. This will vary based on the exact size of your pie pan (mine was 9.5 inches) but for me it ended up being around 37 vanilla wafers. Gently spread half the can of lemon pie filling to completely cover the layer of wafers in an even layer. Take half of the raspberries and spread them on top in a even layer. Spread on an even layer of whipped topping. This ends up being around 1/4 of the container. Now add another layer of vanilla wafers. This ended up being around 30 wafers. Spread the remaining lemon pie filling in an even layer over the wafers. Place the remaining raspberries (except for the ones you pulled aside) in a layer over the lemon pie filling. Spread another quarter of the whipped topping container over the raspberries. Make another layer with the remaining vanilla wafers. Pull the excess sides of plastic wrap over the top of the pie plate to cover it up and refrigerate for at least 4 hours or overnight. Prior to serving, unwrap the top of the pie plate and invert the pie plate onto your serving plate. Carefully remove the plastic wrap from the icebox pie and frost it with the remaining whipped topping and decorate with remaining raspberries. Refrigerate until you're ready to serve or serve immediately.